It’s often a huge challenge to figure out what you should deliver to your subscriber members each month for maximum membership retention and renewal. Plus, you want to deliver something that’ll create referrals and social buzz. This challenge is even more difficult when you are a subscription box trying to negotiate with a company to deliver hundreds or thousands of items so you can ship them to your subscribers as part of their monthly subscription box. There must be a constant balance between getting your hands on products and investing the time and relationship capital to obtain the ones that’ll generate a huge impact. This is the same for a SaaS company choosing which new features to develop or a publisher working with editors to create content. In my recent interview with James Erickson, owner and CEO of Stridebox, a subscription box service for runners, we discussed his solutions to the problems of getting items for Stridebox that drive engagement, how to balance content that members would readily appreciate versus delighting them with new discoveries, as well as how to engage subscribers to create a community. From outside the subscription box industry it could look mysterious and challenging. In the end, it’s very similar to any subscription business. It all comes down to creating great deliverables your members eagerly use, delighting your members with something new each month and engaging subscribers into your vibrant tribal community. 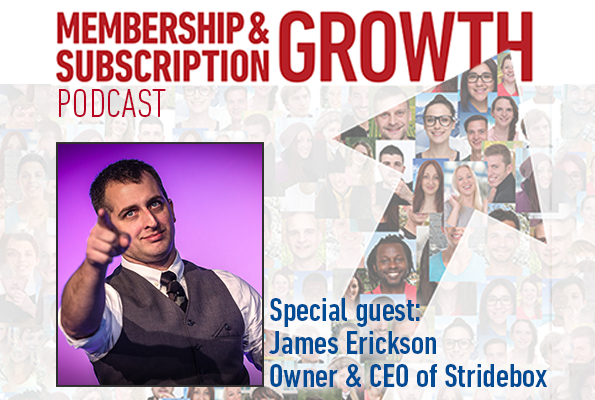 Discover more of James’ membership retention secrets in the full interview of Membership and Subscription Growth. Click on the links below to listen to the podcast or download the transcript. To continue to get updated and useful information as well as advice from some of the most successful entrepreneurs in the subscription economy, subscribe to Robert’s podcast: Membership and Subscription Growth. Great Article! Way to go James! Keep it up!